Socky™ platform — Mundo Pato Inc. The Socky™ platform aims to create an engaging experience for children with ASD and help therapists drive automatic progress. The platform allows ABA companies and therapists to curate and generate ABA programs and sessions, automatically. Now, instead of preparing categories, pictures and reports manually, sessions can be customized through the platform or added to pre-loaded ABA program templates. Sessions run automatically on the learner’s device and performance data is captured instantly for progress reporting. Socky™ platform is specially crafted for ABA therapists and educators for kids with ASD. The platform makes it easier than ever to create ABA programs, track progress, coordinate and communicate instantly with everybody involved. For the first time, instead of creating ABA therapy programs and content manually, now you can create automated ABA programs for behavioral, academic and social communication skills. These automated programs are carefully prepared to provide children a guided and interactive experience. Once you join Socky™ platform you’ll have access to exclusive sessions created by ABA therapists and professionals alike, sharing new insights, progress, and major breakthroughs. The behavioral team can now have more time to focus on the clients and making progress while tending to more families in need for therapy. 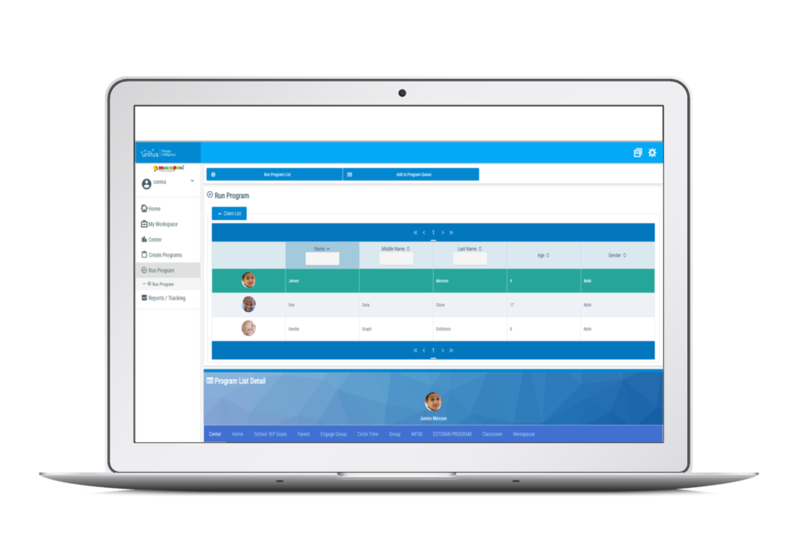 For the first time, instead of creating therapy programs by preparing picture cards and reports manually, the Socky™ platform allows existing ABA programs or customize them to each individual. You can create automated ABA programs for social development, communication skills and more. These sessions provide children with a guided and interactive experience. Once the interactive therapy program is finished, all performance and scores are presented automatically in the UnitusTI reporting tab. Socky™ is delivered through subscription to the UnitusTI data records management cloud service as an interactive Material that you, as a professional, can use to capture program and progress data while engaging your client or student in a fun, interactive manner. Where you can curate automated programs according to your treatment goals. When choosing to use an existing program you can assign it to a client and launch it to run on the child’s device (Picture 1, Session Discovery – Sessions library). All programs are completely customizable to your needs and preferences. You can choose to modify an existing program or create your own special programs (Picture 2&3, Session view). Full featured app for the therapist and dual interface for iPad and mobile phones that kids love. The program is running on the child’s device. Automated data collection is built-in within the app and allows the professional to focus on the actual intervention (Picture 4, Child’s device). The Socky™ platform is delivered via subscription to the UnitusTI electronic data records (EDR) cloud. Sigal Tidhar-Paz - Ph.D., BCBA-D, Psychologist and Senior Consultant in Applied Behavior Analysis. Socky™ Platform ready to use automatic ABA programs and sessions created by our Behavioral Analysis Advisor Sigal Tidhar-Paz - Ph.D., BCBA-D, A Psychologist and a Senior Consultant in Applied Behavior Analysis. Dr. Tidhar-Paz: "For the first time we are using cutting edge technology to save both time and hassle. This system will allow professionals to do their job more efficiently and accurately and to offer services to more patients with Autism waiting to gain the great benefits of Behavioral Therapy." Designing, implementing and monitoring behavior analysis programs for children with ASD and Developmental Delays. Supervising teams implementing direct one-to-one behavior analysis programs. Guiding supervisors for ABA home programs and ABA schools’ and kindergartens’ programs. Dr. Tidhar-Paz was running replication research of Lovaas’ behavioral intervention for young children with ASD as a part of the UCLA Multi-Site Young Autism Project. Shulman, C., Tidhar, S. & Bukai, O. (2000). Diagnosis and Assessment of Young Children with Autism. Presentation at SRCD, Minneapolis, MN. Shulman, C. Bukai, O., & Tidhar, S. (2001). Communicative Intent in Autism. In E Schopler, N. Yirmiya, C. Shulman, & L. Marcus (Eds.). The Research Basis for Autism Intervention, pp. 117-133. NY: Plenum Press. Yirmiya, N., Pilovsky, T., Tidhar, S., Nemanov, L., Altmark, L. & Epstein, R. (2002). Family Based and Population Study of a Functional Promoter-Region Monoamine Oxidase A-Polymorphism in Autism: Possible Association with IQ. American Journal of Medica Genetics (Neuropsychiatric Genetics). 114, 284-287. *The Socky™ Platform is owned and copyrighted by the program author and is provided by Mundo Pato Inc. as an optional, 3rd party add-on to the UnitusTI electronic data records cloud service. Some of the information on this web page has been provided by external sources. Mundo Pato Inc. is not responsible for the accuracy, reliability or currency of the information supplied by external sources. Users wishing to rely upon this information should consult directly with the source of the information. For subscription information, please book a free demo or contact sales@mundopato.com.